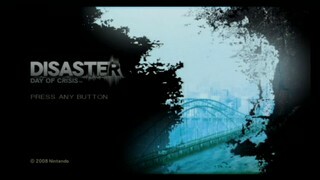 Developed by Monolith Soft in 2008, Disaster: Day of Crisis is a Wii title that never saw the light of day in the US. You take control of Ray, a professional rescuer who is suddenly very busy saving the populace from a wide assortment of seemingly natural disasters. However, there's a shadowy terrorist organization behind all of them, and it falls to Ray to thwart their plans and save the world. Best New Game+ time on Normal difficulty: 2:09:23 by Nicholas 'Sir VG' Hoppe on 2012-08-08, done in 24 segments. This is going to be...one hell of a run. * Survives several natural disasters. Disaster: Day of Crisis is an action-adventure game developed by Monolith Soft for the Wii. This was their last project while working for Namco Bandai before they were sold to Nintendo. Unfortunately due to poor sales in Japan and Europe, the game was never released in the US. Kinda sad, because this is a good game. Not GREAT, but definitely a good solid title for any Wii collection. You play as Ray, a member of International Rescue Team who one year ago (the Prologue of the game) survived a massive volcano eruption that caused him to lose his friend, Steve. After losing his friend, Ray quits, gets all angsty, and promises to someday give Steve's compass to Steve's sister, Lisa. The course of the game involves Ray being sent by Olsen to track down a man named Professor Davies, who's a world renowned seismologist who was kidnapped by terrorists. His assisted was also kidnapped - who happens to be Lisa. As Ray tries to track them down and free them, a number of natural disaster occur within a 24 hour period, including an earthquake (9.0 on Richter scale), a tsunami, a volcanic eruption (different volcano then the prologue), and a hurricane. Thus leading to the tagline of the game "...one hell of a day." The run is performed on New Game+, which means that all of the potential weapons are unlocked (and fully powered up) as well as Ray's stats being maxed out. All of the bonus outfits are unlocked as well, though only one matters. The run in its entirety uses Mechanical Ray, which is unlockable by beating the game on Real Disaster difficulty (super hard mode). With this suit on, you don't take damage from enemies (except for special circumstances, like to a couple of things during the final boss fight) and you don't lose stamina. The only thing that you can't do is clear your lungs, which comes into play around the ash after the volcanic eruption (Stage 13, which is Segment 14). If you run though smokey/ash covered sections, you are fine. However there's a large section of that you HAVE to walk as you're carrying Iris for part of the level. The section is barely short enough to allow me to continue using the suit. My weapon choices consist of a handgun (you're forced to have one by the game and in the Up slot), a shotgun, a machine gun, and a rocket launcher. Most of the time I use the shotgun, which does high amounts of damage, has 8 rounds before I need to reload (72 rounds total before it runs out of ammo), and I can pretty much kill anything with it in zoom mode in 1 hit. The rocket launcher I use has the highest damage output of any weapon in the game, but it can only hold 1 shot at a time and takes a long time to reload, so I only use it on a few boss fights (mainly the helicopters). The machine gun just fills out my inventory, but I never use it since while it's fast, it's really weak. I generally don't use the handgun, though you're forced to have one equipped and is used during the final boss fight for the final shot. Overall, the game was a blast to play but a pain to speedrun, mostly for the driving sections (Stage 11 [Segment 12] and the beginning of Stage 20 [Segment 21] being the two worst sections). I hope you all enjoy the run, but suggest you play the game yourselves to enjoy the full experience it has to offer. This run is Copyright (C) 2012 Nicholas "Sir VG" Hoppe and IMAMYTH Colosseum (http://www.imamyth.com/ and http://www.youtube.com/user/SirVG) and is allowed for downloading and private viewing. Permissions for hosting this run have been granted to Radix and Speed Demos Archive. Public viewing of this run is prohibited without prior permission from the creator. The selling or distribution of this run for profit in any way, shape, or form including (but not limited to) selling on eBay and television for profit is prohibited without prior permission from the author. Video hosting sites (i.e. YouTube, etc) may host this video in part or in full, as long as full permission is granted by the author. Any violation of the above listed may result in legal action. Disaster: Day of Crisis is Copyright (C) 2008 Monolith Soft/Nintendo.